The top 5 health benefits of krill oil are discussed in a new article and video from the health experts at PureKrill.com. 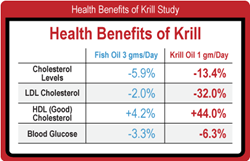 The article also compares krill oil’s health benefit to traditional fish oil supplements. Krill oil is quickly becoming more popular than fish oil as the best source of omega-3 fatty acids. Prized as a high quality source of EPA and DHA, supplementation with krill oil has demonstrated health benefits; including improved cardiovascular health, protecting against harmful inflammation, improved brain health, and supporting muscle and joint health. The krill used in high quality krill oils are often among the purest source of omega-3 known to man. Krill’s purity is a result of their natural location, deep in the coldest and most pristine waters on earth. Unlike farmed sources of fish oil, krill oil’s health benefits are enhanced by krill’s pure diet, eating primarily natural, organic foods. The significant health benefits realized by supplementing with high quality krill oil derive from the structural makeup of the two most important components, EPA and DHA. The natural make-up of krill, and the omega-3 they contain, provide a more natural delivery of the omega-3 to the brain. Krill are also a natural source of the powerful antioxidant astaxanthin; this antioxidant protects against the harmful effects of free radicals and provides stability to the omega-3s found within krill. Among the numerous, and often overlooked, health benefits of krill oil is that once in the body they are converted to compounds called resolvins. These resolvins appear to be several thousand times more potent than the original omega-3, and are much more effective in protecting against inflammation and other inflammatory conditions. Several other benefits of supplementing with krill oil are detailed in the new article from titled The Amazing Health Benefits of Krill Oil. The complete article and video can be found on http://www.purekrill.com. About: Purekrill.com is a new website that was launched in June 2014 in order to educate people on the importance of supplementing with quality sources of krill oil.